The family-run, award-winning Ballyliffin Townhouse is situated on the splendid Wild Atlantic Way and features stunning views overlooking Pollan Bay. Standard double and twin rooms are available for accommodation, as well as deluxe rooms which feature king-size beds. The deluxe rooms also feature exquisite sea views. All rooms have flat-screen televisions, tea and coffee making facilities, and complimentary toiletries. Guests can relax on the townhouse’s charming terrace, which is adorned with fresh flowers and ample seating. There is free parking available on the premises, and Wi-Fi is also available at no cost throughout the townhouse. The Ballyliffin Townhouse also has its own bar and bistro, where guests can enjoy large portions and an inviting atmosphere. Golf is one of the townhouse’s primary nearby attractions, and the Ballyliffin Golf Club with two fantastic courses is less than a kilometre away from the property. The nearby beautiful beaches are just a short distance from Ballyliffin, and if you wish to explore the West of Ireland, this guesthouse is centrally located to the best tourist destinations. The towns of Buncrana and Malin Head are also close by and worth checking out, if you have time. 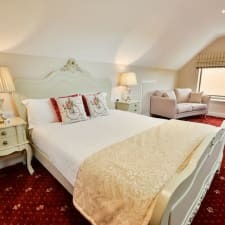 Guests love the modern, spotlessly clean guest rooms at Ballyliffin Townhouse. The beds have also gotten great remarks, so if you're looking for a cosy bed and an inviting, comfortable room, you won't be disappointed here. From the ample spread of breakfast options to well-cooked, hearty dinners, guests can't seem to say enough about the food at Ballyliffin Townhouse. From French toast to fresh fruit, there's something for everyone to enjoy during breakfast. The fact that the service is outstanding is an added bonus. While guests do not appear to have any negative things to say about the amount of space in the deluxe rooms, those who have stayed in guest rooms with two beds have mentioned that the quarters are a little tight. This is something to consider if you have the option to stay in a deluxe room and would prefer having the extra space. It's a minor detail, but guests would like it if the bath towels were a bit on the larger side. Some have found that they're too small for their intended use. If you need to be connected to your devices during your stay, keep in mind that you may experience some difficulty getting a strong signal, according to some guests.